Description: Press conference at Boston Schools Information Center to sum up week one of Phase II desegregation of Boston schools. Ed Baumeister introduces the Boston School Report with a summary of the day's events. Ron Brinn (Information Coordinator, Mayor's Office) introduces the participants. Peter Meade (Mayor's Office) comments on a successful opening of schools. Marion Fahey (Superintendent, Boston Public Schools) gives a report on school suspensions and comments that the atmosphere in the schools is good. William Reid (Headmaster, South Boston High School) comments on the opening week at South Boston High School. Pat Brady (Detective, Boston Police Department) reads a police report detailing arrests and injuries. Brady reports that there were no major incidents today and that extra police will continue to be deployed. Dr. Louis Perullo (Boston School Department) analyzes school attendance statistics. Perullo compares attendance statistics from the 1975-76 school year to attendance statistics from the 1974-1975 school year. Reporters ask Reid about an altercation at South Boston High School and the effect of community demonstrations on the atmosphere in the schools. Reid says that outside disturbances have a negative effect on the atmosphere inside the schools. Fahey says that she has no control over demonstrations outside of the school. Fahey reports on increased attendance at the city's magnet schools. Reporters ask Fahey and Perullo about school attendance and the possibility of a non-white majority in the Boston school population. Fahey says that she is not yet ready to predict a non-white majority. Robert Murphy (Civil Rights Division, US Justice Department) reports on the activity of federal marshals in Boston and the ongoing federal investigations into violations of the federal court order. Ann Foley (administrative assistant to Fahey) announces a change in operating hours for the Boston Schools Information Center. This tape has audible time code on track 2 and visible time code burned in at the top of the picture. 17:00:00: Visual: Opening credits read Boston School Report. Press conference at Boston Schools Information Center sums up events during week one of Phase II desegregation of Boston schools. Ed Baumeister gives a summary of the day's events: school attendance dropped to 68.4% from 69.1% on the previous day; six African American students were sent home after a scuffle with white students at South Boston High School; no suspensions at South Boston High School; three peaceful protest marches were held. Reporters at the press conference include Baumeister and Walt Sanders. 17:00:51: V: Ron Brinn (Information Coordinator, Mayor's Office) opens the press conference, reminding all that it is day five of Phase II desegregation of Boston schools. He introduces the panel: Marion Fahey (Superintendent, Boston Public Schools), William Reid (Headmaster, South Boston High School), Ann Foley (administrative assistant to Fahey), Robert Murphy (Civil Rights Division, US Justice Department), Peter Meade (Mayor's Office). 17:01:52: V: Meade says that the school personnel deserve a lot of credit for their efforts; that students and parents deserve credit for behaving responsibly during the first week of Phase II desegregation. Meade says that the opening of schools was a success; that many doubted it would go as well as it did; that the city's problems are not over. 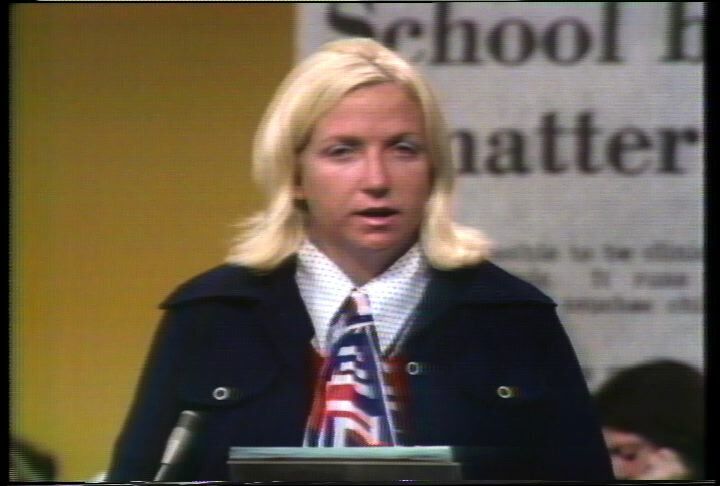 17:03:08: V: Fahey says that she is pleased with the progress made in the schools; that she would like to thank the staff of the school system; that ten African American males, 16 white males, five African American females and three white females were suspended over the past week. She introduces Dr. Louis Perullo (Boston School Department), who analyzes attendance statistics for the school system. She says that there were no arrests in the schools all week; that the atmosphere in the schools is good. 17:05:13: V: Brinn introduces Reid. Reid says that he prefers not to compare Phase I desegregation to Phase II; that they are more prepared this year; that he would like to see higher attendance figures; that the past week at South Boston High School was adequate. 17:06:38: V: Brinn stalls as he waits for Pat Brady (Detective, Boston Police Department). Brady reads a statement from Robert DiGrazia (Police Commissioner, City of Boston). 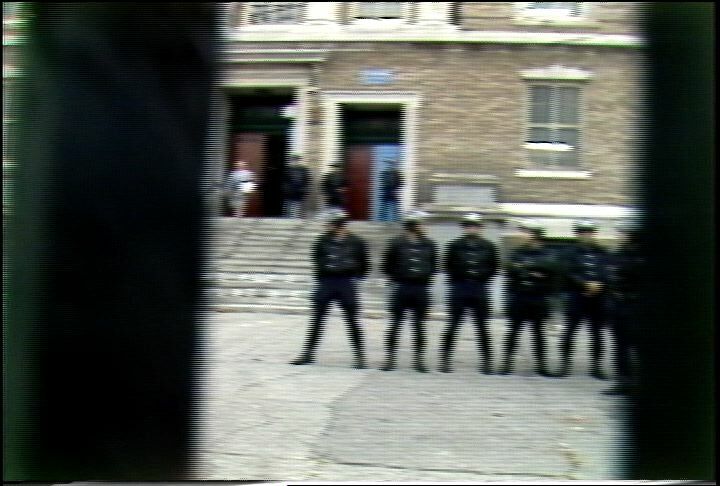 The statement reads that there were no major incidents today; that no students were injured in incidents related to school desegregation during the week; that the peaceful opening of schools was due to increased police presence and effective leadership by community leaders; that 112 arrests were made during the week; that 16 police officers were injured; that DiGrazia is pleased with the events of the past week; that extra police will continue to be deployed. 17:09:00: V: Perullo talks about statistics he has compiled. 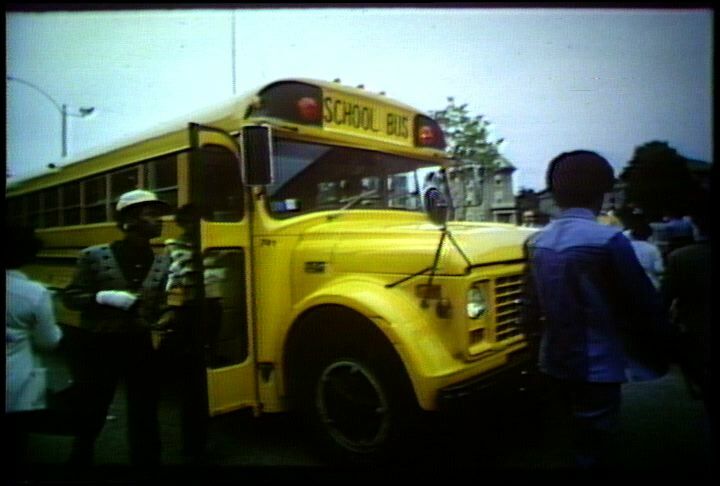 He compares attendance statistics from a Thursday and Friday during the first week of Phase I busing with statistics from a Thursday and Friday during the first week of Phase II. Attendance was down significantly on Friday at all levels during Phase I. Attendance was down slightly on Friday at the high schools and middle schools during Phase II; the elementary schools experienced a slight increase. Perullo says that school attendance usually drops on Fridays. Perullo introduces a table with total attendance by area and level of schooling. He finds that attendance did not change significantly from yesterday to today in any of the areas except high schools; that attendance at Jamaica Plain High School decreased 5.5%; that attendance at Hyde Park High School decreased 6.9%; that attendance at Dorchester High School decreased 5.0%; that attendance at South Boston High School and East Boston High School decreased 4.4% and 5.3% respectively; that attendance at the magnet high schools declined only slightly; that elementary schools in Roslindale saw an increase in attendance of 3.5%. Perullo says that high school attendance increased from 60.3% on Monday to 68% on Thursday; that high school attendance today was down 2.6% from Thursday; that middle schools increased from 60% on Monday to 70.3% on Wednesday; that middle school attendance was down ).7% from Wednesday; that elementary school attendance increased from 58.1% on Monday to 69.8% today. Perullo says that white attendance increased from 56.9% on Monday to 64% on Wednesday; that white attendance was down 1.8% from Wednesday; that African American attendance increased from 62.5% to a high of 75% on Thursday; that today's African American attendance was down 0.6%; that the attendance of other minorities increased from 55% on Monday to 75.9% on Friday. 17:14:52: V: Brinn invites questions from the media. Reporter asks Perullo if he can verify that white students comprise 46% of the school system while African Americans and other minorities comprise 54%. Perullo says he has not yet analyzed those numbers and cannot verify the statistic. Baumeister asks Fahey if she has investigated claims by Frank Power (Headmaster, Charlestown High School), that the projected enrollment numbers are high. Fahey says that she has no answer. Reid says that it is normal to plan for the attendance of every student who might attend, even those whose attendance is doubtful; that students drop out or move away over the summer; that it is difficult to compare actual enrollment to projected enrollment during the first week of school; that actual enrollment is usually less than projected enrollment. 17:17:41: V: A reporter asks Reid about the atmosphere at South Boston High School, as compared to the previous year. Reid says that he does not remember the climate last year; that he has had a good first week of school; that the students were restless today due to a prayer march and rumors of a walkout. A reporter asks Reid about a disturbance resulting in a request for state troopers at South Boston High School today. Reid says that he works closely with Major Gilligan (Massachusetts State Police Department); that Gilligan places troopers where he thinks they will be effective; that decisions concerning the number of troopers are made by him, Gilligan, and the officer in charge of the building; that an altercation at South Boston High School began with an African American student who said he was punched; that three African American students were brought to the office to file reports; that another altercation involving one of these three students occurred after lunch; that he is investigating the situation. 17:20:39: V: A reporter asks Reid if he finds prayer marches and demonstrations outside of the building disruptive. Reid says that any actions taken by the outside community create tension in the school. 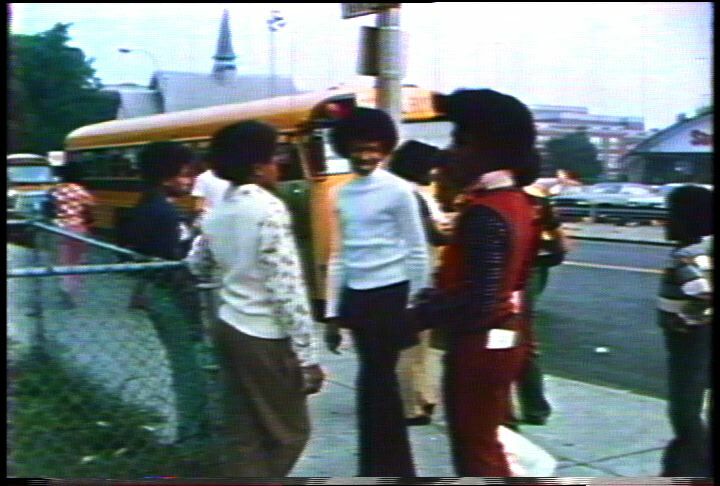 A reporter reminds Fahey that she had told him that demonstrations outside Charlestown High School had no negative effects on the African American students inside the building. Fahey says that she does not dispute Reid's analysis of the atmosphere in his school; that normal school activity is taking place despite marches in South Boston, Charlestown and Hyde Park; that it is not up to her to restrict parade permits for these marches. A reporter says that Headmaster Power had complained that the number of non-school personnel present at Charlestown High School made it difficult to operate the school. Reid says that he shares Power's concern; that the court order allows 12 community persons to be in the school; that two persons are sufficient to monitor activity and report on the atmosphere. 17:22:54: V: A reporter asks Fahey for observations on the performance of the magnet schools so far. Fahey says that attendance has increased at the magnet schools; that programs in conjunction with area universities will be implemented; that programs are currently under review include a program between English High School and University of Massachusetts as well as an open education program involving the Martin Luther King School and Antioch University. Baumeister asks Murphy if any charges have been filed in cases involving Molotov cocktails. Murphy says that no charges have been filed; that charges may be filed at the end of next week. Baumeister reminds Murphy that the local US attorney has already filed civil charges in one case. Murphy says his office is working together with the local US attorney. Baumeister asks if federal marshals have made any arrests on their own in the past week. Murphy says that they have made no arrests. Baumeister asks if they have been instructed to use restraint. Murphy says that they have been instructed to be professional. 17:24:38: V: A reporter asks Meade if he can share any Police Department intelligence. Meade replies that he does not attend the police intelligence briefings and if he did, he would not share the information. A reporter asks Meade if the mayor will continue to request that two battalions of the National Guard be on call for the city at the expense of $37,000 per day. Meade responds that the decision will be made jointly by the mayor and the governor; that the expense had not been discussed; that a reduction of troops in the public safety plan must be submitted to the court. A reporter asks Fahey if she knows the racial breakdown of the kindergarten population. Fahey says that the school department is making efforts to gather that data. 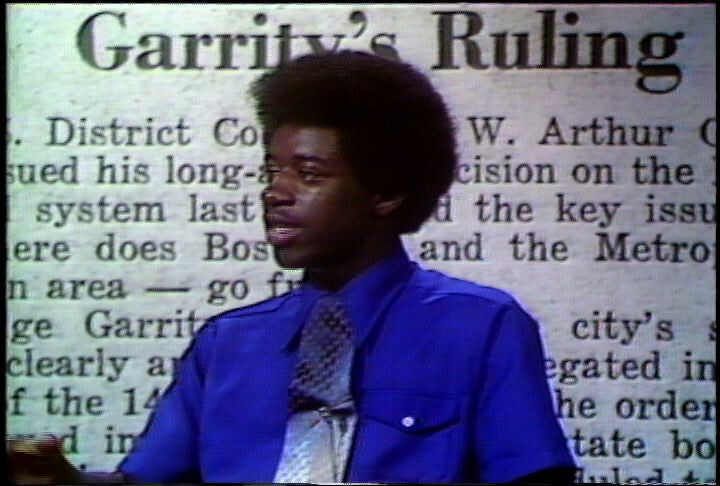 A reporter asks Fahey about the possibility of white students becoming the minority in Boston schools. Fahey says that she is not yet ready to predict a non-white majority; that the school system is engaged in a recruitment program for students of all races; that white attendance has gone up in Roslindale elementary schools; that recruitment is going on in West Roxbury, Jamaica Plain and Brighton; that it is too soon to make predictions. 17:29:26: V: A reporter comments on the fact that white students are staying away from schools in African American communities. Fahey says that this is true; that white parents may be keeping children out until they are sure the schools are safe; that the safety of the schools has been demonstrated over the past week. 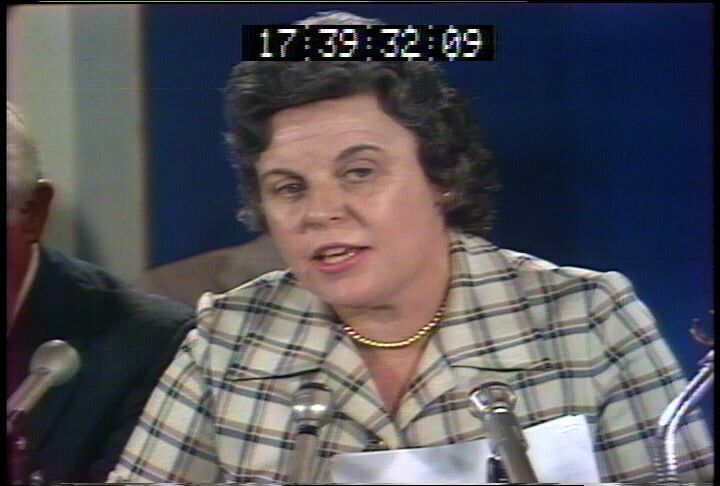 A reporter asks Fahey how long she thinks parents will wait before sending their children. Fahey says that the decision is up to individual parents. Baumeister asks if Fahey has seen results from the campaign to attract students back to the schools. Fahey says she has not had feedback from teachers; that over the past week teachers have been calling the parents of absentee students; that over the next two weeks teachers will write letters to the parents; that teachers will make personal visits to parents if they get no response from the letters or phone calls. A reporter comments that many classes will be racially imbalanced if white students do not return to schools in the next few weeks. Fahey says that she will refer the matter to the court. A reporter asks if it will be easier for parents to transfer students to a new school if classes are deemed to be racially imbalanced. Fahey reviews the transfer procedure and says that a transfer might be accepted if it does not upset the racial balance in either school. 17:35:01: V: Brinn invites other questions. Brady says that two arrests have been reported since his last report. An African American juvenile male was arrested at the Barton Rogers School for disorderly conduct and an African American juvenile female was arrested for assault and battery with a dangerous weapon relating to an incident on September 9th at the temporary Madison Park High School. Brady confirms 112 arrests for the week. Reporter asks if the Tactical Patrol Force (TPF) will be pulled out of South Boston. Brady responds that the TPF is stationed where it is needed. 17:36:46: V: Brinn invites Murphy to make a statement about the past week's events. Murphy says that he is happy that the federal marshals have made no arrests; that few arrests indicate that the situation is not so bad; that the marshals will continue to be stationed at the schools; that his office is investigating a dozen cases; that he does not expect a dozen indictments; that he is working on these cases with the state district attorney's office, the US attorney's office, the FBI, and the Bureau of Tobacco and Firearms. 17:38:28: V: Foley announces a change in operating hours for the Boston Schools Information Center. Foley says that the phone lines will be open until 5:30pm; that the center has received very few calls during the evenings. Fahey thanks the media and mentions that she will no longer attend press conferences on a regular basis; that she will be working hard to improve programs in the schools; that Boston is dealing with the same problems that many urban schools are facing. Fahey excuses herself. Brinn thanks the participants and the media, then closes the press conference. Baumeister gives a summary of the press conference. Description: Press conference at the Boston Schools Information Center on day two of Phase II desegregation of Boston schools. Footage is silent until 00:01:37. Robert DiGrazia (Police Commissioner, City of Boston) takes questions about the arrests of 74 members of the Committee Against Racism, and how the police and judiciary process mass arrests in South Boston. DiGrazia also answers questions about police restraint and police response to violence in the streets. Ed Baumeister (WGBH reporter) notes that there are many arrests for minor infractions and few arrests for major incidents. Greg Pilkington (WGBH reporter) questions the police policy of restraint. DiGrazia says that there is a difference between low visibility and restraint; that police are making arrests. J. Stanley Pottinger (Assistant US Attorney General) discusses the presence of federal marshals in Boston and the ongoing federal investigations into violations of the federal court order. Pottinger says that antibusing activity at night can be considered a violation of the court order. DiGrazia says that police are making great efforts to crack down on violence and vandalism during the evening hours. Peter Meade (Mayor's Office) reports on public safety teams in Charlestown. Marion Fahey (Superintendent, Boston Public Schools) reports on school attendance and atmosphere. She gives information on registration for students without school assignments. Reporters ask Pottinger questions about the federal investigations of antibusing activity. Reporters ask Fahey questions about school attendance and low attendance among white students. Fahey says that attendance will improve as parents and students realize that the schools are running smoothly. This tape has visible time code burned in at the bottom of the screen. 0:01:27: Visual: Press conference at the Boston Schools Information Center. Panelists assemble at a table with microphones. Reporters include Ed Baumeister (WGBH), John Henning, Greg Pilkington (WGBH), and Walt Sanders. Ron Brinn (Information Coordinator for Mayor Kevin White) begins to speak. Audio cuts in and out. 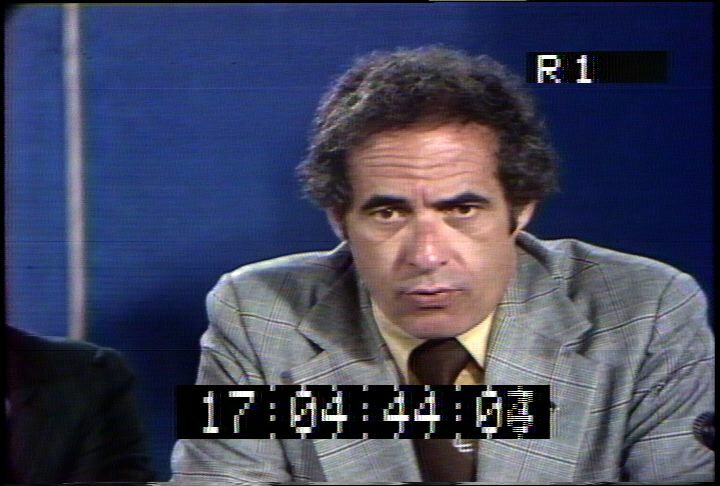 0:03:04: V: A reporter asks about the arrests of 74 members of the Committee Against Racism in South Boston, and a related confrontation with a hostile crowd at the South Boston courthouse. Robert DiGrazia (Police Commissioner, City of Boston) says he has spoken to the parties involved and that the problems at the South Boston courthouse were due to a lack of communication; that Chief Justice Flaschner will work with police and local courts to expedite the booking of arrestees; that he had previously met with Flaschner and others to discuss the expeditious booking of mass arrests; that there was confusion in South Boston on the day in question. A reporter asks if there was a firm agreement with all involved in the meeting to hold court in a venue other than the courthouse if necessary. DiGrazia says there was discussion and plans to implement action if necessary. 0:06:34: V: Baumeister points out that many arrests are made for minor infractions and few arrests are made for more serious acts of violence. DiGrazia responds that there have been quite a few arrests for acts of violence; that members of the Committee Against Racism needed to be moved in order to avoid a major confrontation along a bus route; that the police are trying to neutralize a dangerous situation; that police are showing great restraint. Pilkington points out that restraint by police was not effective during the previous year. DiGrazia interrupts him by saying that there is a difference between low visibility and restraint; that police are actively making arrests this year, but are showing restraint. Reporter asks if there is discussion of calling in the National Guard to aid police at night. DiGrazia says that police are working long hours but performing well; that there are no plans at present to call in the National Guard. 0:09:38: V: A reporter asks about the possibility of federal charges being brought against some arrestees. J. Stanley Pottinger (Assistant U.S. Attorney General) responds that charges are being investigated; that federal and state charges may be lodged; that he is personally involved with five investigations. A reporter asks how federal marshals can aid police in the evening if their mandate is to enforce the federal court order. Pottinger says that certain actions outside of school hours could be handled by the federal marshals as violations of the federal court order; that federal marshals are there to assist police; that federal marshals are working long hours. Pottinger confirms that the Justice Department is investigating an incident at the JFK Home and a Molotov cocktail incident; that they are investigating reports of direct intimidation of individuals trying to comply with the court order; that they are investigating some arrests for the assault of police officers. 0:12:38: V: Pilkington asks if the violence committed by youth gangs in Charlestown constitutes a violation of federal law. Pottinger says that the violence may be a violation, especially if the violence involves an assault on a police officer or a fire official. Reporter asks what will be done about nighttime violence and vandalism. DiGrazia says that he will increase police numbers in Charlestown and South Boston; that police will be assisted by federal marshals; that federal marshals will investigate assaults on police officers. A reporter asks Peter Meade (Mayor's Office) to clarify a statement indicating that he has complaints against the media. Meade says that it was a humorous statement directed at a reporter whom he knows well; that he would like to clarify a his answer to a question from yesterday about police presence in Charlestown. 0:15:31: V: A reporter asks Meade what public safety teams are doing to prevent violence and vandalism in Charlestown. Meade says that several people are on the streets trying to calm the situation; that Roberta Delaney (Manager, Charlestown Little City Hall) will hold a meeting that afternoon with a public safety team; that antibusing leaders in Charlestown have made it clear that they do not support violence. A reporter asks DiGrazia to compare today's violence in Charlestown to that of the previous day. DiGrazia says that police did a good job in defusing a difficult situation today. A reporter asks if federal marshals will be on duty for the evening. Pottinger says that the federal marshals will not be on patrol; that they will be available upon request from police. 0:18:09: V: Brinn introduces Marion Fahey (Superintendent, Boston Public Schools). Fahey thanks the public safety officials. Fahey says that attendance is up for both African Americans and whites; that there has been one suspension and no arrests; that the climate in the schools is good; that extracurricular activities are proceeding. Commissioner DiGrazia excuses himself and leaves. A reporter asks Fahey about low white attendance in West Roxbury. Fahey responds that they are watching the situation and will contact students who are absent. Reporter comments that attendance in elementary schools is primarily African American. Fahey says that some white parents may be waiting to assess the climate at the schools before sending their children; that she is confident that white attendance will go up. 0:21:37: V: A reporter asks Pottinger if there are some individuals under investigation who have not been arrested. Pottinger says yes, but that he will not give details. A reporter asks Fahey about students who have not yet been assigned to school. Fahey gives information on two sites where student registration will be held on the following day. Fahey asks the media to disseminate the information. Fahey says that 800 students were processed in last week's preregistration; that 400 students were processed today; that she has no way of knowing how many students still need school assignments. Fahey tells a reporter that she has no information on the suspension of an African American male student today. A reporter asks Fahey about plans to assess student achievement in the desegregated schools. Fahey says that she is working with consultants on assessing math and reading; that attendance is another indication of school performance. 0:25:21: V: Brinn interrupts to clarify Pottinger's title as he prepares to make a statement. Pottinger explains that he will be absent for a few days for personal reasons; that Robert Murphy (Civil Rights Division, US Justice Department) will be in charge in his absence. Brinn checks with Meade to see if he has a statement, then invites more questions. A reporter asks Pottinger for more detail on investigations of people who have not been arrested. 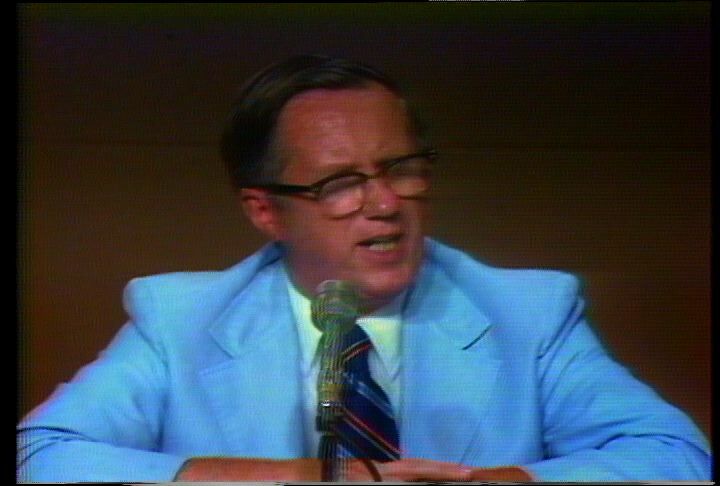 Pottinger says that the investigations are centered on intimidations and threats to those trying to comply with the court order; that the FBI is investigating allegations; that it is possible to move quickly toward indictment if the evidence is sufficient; that he cannot predict when or if an indictment will occur. A reporter asks Pottinger about the five investigations he is involved with personally, and whether they concern people who have not been arrested. Pottinger says that he is familiar with five investigations concerning threats and intimidation as well as arrests made by the state; that there may be other investigations; that there are sitting grand juries available to hear these cases; that he does not think it will be necessary to empanel a grand jury. 0:28:49: V: A reporter asks Fahey where the 25,000 absentee students are. Fahey responds that she does not know. A reporter asks for a summary of the attendance figures. Robert Donahue (Boston School Department) says that the attendance has increased; that some parents have kept children out of school; that attendance will increase as it becomes clear to parents that schools are functioning normally. Fahey gives a rundown of attendance figures for the first and second days of school: that attendance was 60.3% and 64.1% at the high schools; that attendance was 60.1% and 65.8% at the middle schools; that attendance was 58.1% and 64.9% at the elementary schools. 0:30:44: V: Brinn thanks the panelists and closes the press conference. Baumeister gives a summary of the conference. Reporters mill around the room.